Ethnic Cleansing | Israel Genocide? Due to the membership restriction on this article, detailing Israel’s broader plan to expel the indigenous Palestinian population, we copy the entire piece below. While the word ‘genocide’, isn’t used, the element of ethnic cleansing, by exile and massacre is clearly present. Issachar “Yiska” Shadmi, after his trial, holding the 10-prutot coin he had to pay as a symbolic fine. Residents of Kafr Qasem were infuriated by the punishment. In mid-July, a strange performance played out in the Military Court of Appeals at the Kirya, the defense establishment’s headquarters in Tel Aviv. The judge, an Israel Defense Forces general, called Meretz MK Esawi Freige, from the Israeli Arab town of Kafr Qasem, to the witness stand, and asked him just one question: Would publication of classified documents relating to the massacre in his village in 1956 be likely to stir up its residents? Freige, several of whose family members were among the dozens of victims killed by the Border Police, responded that the anger has not dissipated in the 62 years that have passed since the incident. However, the MK emphasized, the villagers are not looking for revenge. “We have no interest in disrupting the security of the state or the life of any person,” he said, adding that people know exactly where Brig. Gen. (res.) Issachar “Yiska” Shadmi, the highest-ranking officer to be brought to trial after the event, lives. Shadmi, the commander of the brigade responsible for that area at the time – and under whose orders the massacre was carried out – was not far away at the time, sitting in his spacious home in the upscale neighborhood of Ramat Aviv. He didn’t know that his name was once again being raised in connection with the affair that had hounded him for his entire adult life, like a mark of Cain imprinted on his forehead. The trial, which is still ongoing, involves a lawsuit by historian Adam Raz, who is demanding that the IDF and Defense Establishment Archives declassify documents relating to the affair. “Most of the material is still classified,” says Raz, 35, who works for the Berl Katznelson Foundation, in a recent interview with Haaretz. “I was surprised to discover that it’s easier to write about the history of Israel’s nuclear program than about Israel’s policies regarding its Arab citizens.” The court has yet to hand down its judgment, but Raz’s Hebrew-language book “Kafr Qasem Massacre: A Political Biography,” is being published this month by Carmel Press. It is the first such comprehensive study of the affair. One of the people Raz interviewed was Shadmi, who died last month at the age of 96. Back in the summer of 2017, this writer joined Raz for the conversations with Shadmi, which took place at the latter’s home. With the frankness often reserved to those who have reached a ripe old age, Shadmi provided a rare, troubling behind-the-scenes look at one of the formative events in the history of the State of Israel, and especially of its Arab community. Among other things, the incident gave rise to the concept of a “blatantly illegal order,” and led to an exceptional apology by the president of Israel for a crime that the state’s soldiers committed against its citizens. Now, in the wake of Shadmi’s death and the publication of Raz’s book, we are publishing the former IDF officer’s testimony for the first time. At its center is his contention that the 1958 court case against him was nothing more than a show trial, staged in order to keep Israel’s security and political elite – including Prime Minister Ben-Gurion, IDF Chief of Staff Moshe Dayan, and GOC Central Command (and later chief of staff) Tzvi Tzur – from having to take responsibility for the massacre. Shadmi told us that the trial, in which he was initially accused of murder but later acquitted, was intended to mislead the international community with regard to Israel’s ostensible pursuit of justice. For his part, Raz is convinced that the background to ostensibly staging the trial was pressure from above to conceal “Operation Mole” (Hafarperet), a secret program to expel to Jordan the population of the so-called Triangle of Arab towns, located southeast of Haifa – details of which have never been revealed. Shadmi was blessed to have been able to age in dignity. In his final years, he was lucid and enjoyed good health. When he died, he was buried in the cemetery of the kibbutz of which he had been an early member, Sdot Yam in Caesarea. In our long conversations with him, he recalled minute details of the formative incident in his life. Yiska Shadmi’s life was replete with all the episodes one would expect in the biography of a member of the so-called 1948 generation, the generation that founded the state. Were it not for the stain of Kafr Qasem, he would have entered the history books as one of the first senior commanders of the IDF, and perhaps he would even have gone into politics, like his friend and peer Yitzhak Rabin. Shadmi was born in 1922, the sabra son of two immigrants from Eastern Europe, Shoshana (née Goldberg) and Nahum Kramer. The family name, meaning “grocer” or “peddler” in German, was Hebraicized to Shadmi, a derivation of the biblical word shdema, or field. “Agriculture, not commerce and the stock market. This was the Zionist revolution,” he wrote in his memoir. Nahum had served in the Red Army, and became one of the first commanders of the Haganah pre-state army and then of the nascent IDF. Yiska, an only child, spent his earliest years on the agricultural settlement Bitanya, near Lake Kinneret, before moving with his parents to the nearby community of Menahemia. As a boy, he received initial training for the Haganah. In his memoir, he writes of his first military operation, serving as aide de camp to Haganah officer Yigal Allon, who would later serve as the legendary commander of the elite Palmach strike force. At about the same time, during the years of the Arab Revolt (1936-1939), Shadmi became aware for the first time of the Jewish-Arab conflict. In 1939, Shadmi joined Kibbutz Sdot Yam, which had initially been founded in 1936 north of Haifa but moved south to Caesarea in 1940. He served in the British Mandate’s coast guard, and later as a Palmach platoon commander at Beit Ha’arava, near the Dead Sea, and as a commander in the Haganah Field Corps in Samaria. During “Black Sabbath” in 1946 (when Mandatory forces rounded up several thousand Jewish soldiers and officials, following a spate of violent actions by Jewish forces), he was arrested and taken to a British detention camp. In the War of Independence, he commanded the Fifth Battalion of the Harel Brigade and the Seventh Battalion of the Negev Brigade. Afterward, he climbed the ranks in the IDF and served, among other positions, as commander of the Officers Training School and of the Golani Brigade. Then 62 years ago this month, Shadmi stepped on his land mine. It all began on October, 29, 1956, the first day of what would be called the Sinai Campaign. Shadmi, then responsible for a Central Command brigade, was tasked with defending the area abutting the Jordanian border, and ordered the ongoing curfew that was then in effect, under martial law, to begin earlier than usual that day on the Arab villages in the vicinity, among them Kafr Qasem. At his trial, Shadmi denied ordering the killing of curfew violators. Whatever the case, the result was a disaster. Between 5 P.M. and 6 P.M. on that fateful day, 47 Arabs who were returning to their homes in Kafr Qasem – boys and girls, women and men – were shot to death by Border Guard troops. An additional victim, who was elderly, had a heart attack after he learned that his grandchild had been killed. In the end, according to the villagers, the total number of victims was 51. Eight of the 11 IDF officers and soldiers put on trial for the shootings were convicted and sent to prison for varying terms, but later their sentences were commuted, by the president and chief of staff, among others. By 1960, all had been released without having served most of their jail terms. Some were even awarded desirable state jobs – Malinki, for instance, was appointed chief of security at the nuclear reactor at Dimona by Ben-Gurion. Shadmi was convicted on only one procedural and technical charge – of “exceeding his authority” and giving orders regarding the hours and parameters of the curfew, when only the military governor was authorized to do so. The punishment he received infuriated the residents of Kafr Qasem: a symbolic fine of 10 prutot, or one-100th of an Israeli pound, and a reprimand. When he left the courthouse, Shadmi excitedly waved his hand, grasping a 10-prutot coin. A photo of this was published in the press and Shadmi’s coin thus became a watchword among Arab citizens of what they saw as the cheapness of their lives in the eyes of the regime. 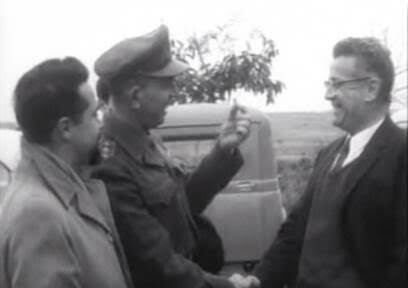 Shadmi celebrated his “victory” with Prime Minister Ben-Gurion, who described in his own diary how “we drank to his exoneration.” A party was held at Sdot Yam, with Chief of Staff Haim Laskov and other IDF generals in attendance. Yet in retrospect, Shadmi told Adam Raz and myself, the expressions of joy were mostly for public consumption; he was not at all surprised by the verdict he received. He told us that the outcome of the trial, which he called a “play” and a “show trial,” was fixed from the start. From his descriptions – some of which also appear in his self-published memoir – it seems that the legal proceedings were conducted in defiance of all accepted norms. From the start, he claimed, he was promised the best legal defense. The state appointed the highly respected attorney Yaacov Salomon – and paid for his services. In light of this, Shadmi said he felt the balance of power between the weak military prosecutor and the superlative defense he was awarded was always tilted in his favor. Asked now for his response to Shadmi’s comment, former justice Shamgar told Haaretz that he did not remember saying such things. Behind his words hid Shadmi’s most serious criticism, according to which Salomon, as Ben-Gurion’s emissary, tried to use Shadmi as a means to distance senior IDF commanders and the political echelon from the Kafr Qasem massacre – as a kind of punching bag to stand trial in their stead and prevent the indictments of others. In the center of the drama stood Tzvi “Chera” Tzur, who was Shadmi’s superior officer at the time of the massacre and later became the IDF’s sixth chief of staff. Shadmi was convinced that the judges “needed to protect Chera” and that his attorney “was not protecting me, but protecting the IDF and Tchera and the rest of those…. So this wouldn’t climb any higher,” in his words. It bears mentioning here that in those days, the ICJ did not operate in a way that would made it possible to put Israeli officers or politicians on trial. However, as historian Raz notes, “the fact Shadmi was mistaken about the international judicial system, didn’t mean that there wasn’t real concern in the Israeli upper echelons about an international response.” According to Raz, from Ben-Gurion’s response to the affair, it appears that the Israeli leadership was in fact “very worried about the potential international response.” But if there is any documentation of this in the state archives, it is not accessible to the public. Shadmi’s account, as we heard it last year in his home, are borne out by the facts appearing in the archival documents. Indeed, Raz did encounter other testimony in the army archives suggesting that already then, people were calling for more senior figures than Shadmi to stand trial. Shadmi’s silence with respect to those above him paid off, even if not immediately. On the military level, his promising career came to an end in 1962, and he was not promoted to the rank of full general like his peers. He continued to serve in the reserves, fighting in the Six-Day War and the Yom Kippur War, in which he was seriously wounded in a helicopter crash. Behind the scenes, though, as Shadmi claimed, a deal was cooked up that paid off later for both sides. “Chera wrapped me up in cotton,” he said, referring to Tzvi Tzur. “I got anything I wanted,” he recalled candidly. Adam Raz is convinced that there was a reason that Shadmi’s trial was staged and aimed to protect his superior officers, as well as for other reasons. Raz believes there was an effort at the same time to hide the existence of a secret program called “Operation Mole,” whose goal was the expulsion of Arabs from the Triangle, which included Kafr Qasem, to Jordan. To understand the historical context connecting Operation Mole, the Sinai Campaign and the Kafr Qasem massacre, one must remember that in roughly that same period, up until the Six-Day War, when Israel conquered the West Bank, Arab villages like Kafr Qasem were situated very close to the border with Jordan. In the weeks before the massacre, tensions rose and many infiltrators penetrated Israel. The IDF was increasingly worried about cooperation between the latter and their countrymen in the Israeli villages. Until 1966, martial law was in effect in those communities, among them Kafr Qasem. The massacre occurred on the day the Sinai Campaign began: In it, Israel, England and France joined forces in fighting against Egypt, and eventually the IDF conquered the Sinai peninsula. In a certain sense, the massacre was part of that same war, but took place on a completely different front, as Rubik Rosenthal wrote in his 2000 book “Kafr Qasem: Events and Myth” (Hakibbutz Hameuchad), the first book about the massacre. In the period prior to the Sinai Campaign, Israel launched a diversionary operation, in the context of which forces were concentrated along the Jordanian border, including the area of Kafr Qasem, to create the impression that Israel was preparing an attack on its eastern front. “The lower ranking officers and troops that participated in the operations thought that war really was breaking out on the eastern border,” writes Rosenthal. Raz thinks one must see the Kafr Qasem massacre in this context: “The massacre wasn’t perpetrated by a group of soldiers who were out of control, as has been argued until today. From their point of view they were following orders, which in essence would lead to the expulsion of the villagers,” he says. Or, in other words, they were operating in line with the directives of Operation Mole, as they understood them. Raz’s study presents much testimony that supports this view. In his book he reconstructs the hour-by-hour chain of events that led to the horrifying outcome on that fateful day, and thus proves his claim that there is a connection between the massacre and the secret operation. Thus, for example, he provides authoritative documentation about meetings prior to the massacre between the battalion commander, Malinki, and other top brass, which dealt with the secret scheme – sometimes explicitly and sometimes without actually naming it. On October 24, five days before the killings in Kafr Qasem, Malinki met with the GOC Central Command Tzur. According to Malinki’s testimony, he was told that, with war approaching, one of the missions of his battalion would be to deal with the Arab villages in the Triangle. “There is a complex portfolio at the Operations Directorate and I must prepare the mission,” he said. On October 25, Malinki met with the military governor, Zalman Mart, who emphasized that “the issue is how to motivate them [the Arabs] to leave the country.” Several hours later, Malinki met with Tamir, then chief of Central Command’s operations branch. The latter conveyed the directives of the plan. On the morning of October 29, Shadmi announced that the plan had not been authorized in its entirety, but particular clauses would “of course” be authorized by the afternoon. As to what happened in the meeting between Shadmi and Malinki, a few hours later, it emerges that a dispute broke out that dogged them both until their final days. Two months after the massacre, Malinki claimed that he had not been comfortable under Shadmi’s command, but didn’t do anything about it. “I thought about calling the commander of the Border Police, but that seemed like an act of disloyalty with regard to the officer in question. I didn’t know [Shadmi], but as I was a witness to his conversations with the general [Tzur] with regard to the Mole and as I had personally received the order for that operation from headquarters – I was stunned by the drastic approach that had been decided upon, but didn’t doubt that this was a decision of the highest authority, and I saw the brigade commander as a pipeline,” Malinki later wrote to Ben-Gurion. General Tzur himself responded to the secret plan, in testimony before the investigative commission that Ben-Gurion convened immediately after the massacre, prior to the trial. He explained that Operation Mole “relates to the entire country and all are working according to the same methodology,” adding that the operation was part of an overall plan of war vis-a-vis Jordan. Here is where the staged trial that Shadmi claims was conducted, enters the picture. In its course, as noted, he covered for his superiors and did not open his mouth about Operation Mole. At present Raz is waiting for the decision of the military appeals court as to whether he will be allowed to examine all the classified documents relating to the affair of the massacre at Kafr Qasem, and more generally those relating to Operation Mole. For its part, the army claims that declassifying these documents will impair the security of the state, its relations with foreign entities, and also the privacy and well-being of various individuals. As for Shadmi himself, he raised four children with his wife, Pnina, a math teacher who died in 2013; there are also grandchildren and great-grandchildren. Their son, Col. (res.) Yiftah Shadmi, served as a fighter pilot in the air force. “… when I think of Unholy Alliance, I first think of the title I gave to the book and which is relevant to my lecture this evening: Atrocity and the Language of God. My book is less about how religion and power come together in atrocity, others have covered that territory and been heartily rewarded for it. Rather my book is about how atrocity, mass death but also genocide and ethnic cleansing, leads to, must have, and is in intrinsically bound up with, distortions in language and religion. After mass death, genocide and ethnic cleansing the language these horrors were carried out in carry the trauma it enabled. So, too, religion that blesses atrocity. The UN Security Council Resolution 2334 ignored the crime of the near-half century Occupation by Apartheid Israel but at least spelled out the egregious violations of international law associated with that Occupation. To that extent, passage by the UN Security Council of Resolution 2334 (unanimously except for abstention by an intractably racist US) is an ineradicable game changer. The ongoing Palestinian Genocide by race-based Apartheid Israel has now been recognized 14 to 0 by the UN Security Council, if not with use of that terminology, by “Condemning all measures aimed at altering the demographic composition, character and status of the Palestinian Territory occupied since 1967, including East Jerusalem, including, inter alia, the construction and expansion of settlements, transfer of Israeli settlers, confiscation of land, demolition of homes and displacement of Palestinian civilians, in violation of international humanitarian law and relevant resolutions”. The similarities between Australia and Israel should come as no surprise. Settler colonial societies are a distinct type of imperialist formation, which are premised on the racist elimination of the indigenous population through various means, including ethnic cleansing, genocide and/or assimilation. …the term has been put to the critical test by legal experts and researchers, because it is often used as a euphemism for cases that should actually be labeled genocide. The phenomenon of ethnic cleansing is not easily defined. On one hand, it is different from applying pressure to emigrate and population transfers; and on the other, it is also different from genocide. There is widespread agreement in the research field that ethnic cleansing is a form of forced migration — which can become violent and murderous — of an unwanted population from a specific territory because of a racial, ethnic, religious, political, strategic or ideologically based hostility. This is exactly what happened in 1948.